Walter Witschey Is Having the Time of His Life | Cover Story | Style Weekly - Richmond, VA local news, arts, and events. The bespectacled director of the Science Museum is about to retire. But his other life as a rattlesnake-dodging, jungle-searching Maya archaeologist is just starting to take off. mosquitoes at the field archaeology office in the small Mexican town of Telchaquillo? Shake the inevitable scorpions out of your boots. That's just the beginning of the daily dangers that Walter R.T. Witschey faced during his six-week expedition through the Yucatan jungles of Mexico in 2005. He was there with his research partner, archaeologist Clifford Brown, to seek out previously unreported ancient Maya archaeological sites. "It's not for sissies," Witschey says, laughing heartily. The Yucatan jungle isn't called the thorn forest for nothing, he says. The vegetation includes bushes with 3-inch thorns, "and if you catch one on your sleeve or arm and snap it off, it opens a hole in the stem, out of which flow poisonous ants." Oh, and there are also sudden depressions in the jungle's limestone floor that open into pits with 30- to 60-foot vertical drops. And, Witschey adds, "you don't see [the pits] until you arrive at the edge." Other hazards? Tarantulas and rattlesnakes. 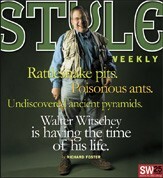 "The open rubble of ancient pyramids is an ideal pit for a rattlesnake to crawl into," Witschey says. And where there's are one, there are several. "As our guys were clearing a temple platform, out came a snake.
. This was a 6-foot rattlesnake with a bunch of rattles on it, with the fat part about like that," he says, wrapping his hand around his lower arm. "One of the Maya guys. and spent six or eight minutes putting a sharp point on it that was about 8 or 10 inches long and stabbed the rattlesnake right through the head  first jab! I was impressed! I couldn't have begun to do that." If all of this doesn't quite sound like the affable, pudgy, bespectacled and bow-tie-wearing Witschey you've known as director of the Science Museum of Virginia for the last 15 years, you're in good company with most other Richmonders who have visited the museum or read Witschey's pithy science columns in the Richmond Times-Dispatch. But Witschey, a 65-year-old father of five and grandfather of 10, has also led a less well-known life as an archaeologist and explorer, working with Brown, an archaeologist with Florida Atlantic University, on the creation of a computerized database of more than 4,600 Maya archaeological sites. Witschey, who was honored with a joint resolution of commendation by the Virginia General Assembly last month, will be retiring this summer from the Science Museum of Virginia to become a professor of anthropology and science education at Longwood University. There, he'll both teach and work on his research as a Maya archaeologist. The second director of the Science Museum of Virginia in its 37-year history, he will remain in an advisory capacity as the museum's director emeritus. In Witschey's long and varied career, he has led many roles, including being a pioneering, pre-Internet CEO who launched a national computer business. Witschey also opened Richmond's first retail personal computer store in the 1970s. But now he's returning to his primary passion: Maya archaeology. "Virginia's losing a good museum director, but Maya archaeology's getting a great Maya archaeologist back again," says E. Wyllys Andrews V, a professor of anthropology and Maya archaeologist at Tulane University, where he served as Witschey's faculty and dissertation adviser. "He's done a wonderful job there  he's a wonderful administrator," Andrews says of Witschey's tenure at the Science Museum. "But he's definitely not had the time to do the archaeology he's wanted to do." Witschey "is going to be a tremendous addition to Longwood," says Longwood University President Patricia P. Cormier. "He is a remarkable individual. Last fall, Witschey gave lectures to classes at Longwood, and "he wowed both faculty and students," Cormier says. "He has such a love of the subject matter, it just emanates from him. He makes people love whatever he's teaching." Cormier has known Witschey for more than 10 years, but even she found some surprises looking over Witschey's impressive résumé. "I looked at the number of computer languages he knows. It's astonishing!" She counts aloud down the list  "He knows 42 computer languages!" Witschey's love for all things Maya dates back to summer 1951, when he was growing up in Charleston, W.Va. His father, an accomplished CPA, and his mother, a Juilliard-trained concert pianist, gave him a 10th-birthday gift that started him on a lifelong journey: the book "Gods, Graves and Scholars: The Story of Archaeology" by C.W. Ceram. Decades before Indiana Jones was brought to celluloid life, the young Witschey thrilled to the pulse-pounding adventures of real-life explorers and treasure hunters such as Howard Carter, who unearthed the fabulous golden spoils of King Tut's tomb, and Heinrich Schliemann, who excavated ancient Troy, and Sir Arthur Evans, who unearthed the Minoan palace of Knossos. Despite the splendors of the tomb of Tutankhamun, it was the book's description of the Maya archaeological sites that really captured Witschey's fancy. "I was compelled by the art and architecture," he recalls, "the base-20 mathematics system, by the sophisticated astronomy and by the fully productive writing system." The Maya people were also advanced at statecraft and city-building, creating some buildings the height of the Federal Reserve building in Richmond, Witschey says. They built white-stone roadways that stretched for miles, projecting power and sending the message to nearby Maya cities "that I can get to you in a heartbeat." But Witschey, who earned his undergrad degree in physics from Princeton University in 1963 and an MBA in operations research from the University of Virginia in 1965, began his career in 1965 about as far from Maya archaeological research as you could imagine. He worked in a computer research job for IBM in Richmond. In 1970 he and a group of other IBM employees started The Computer Company (TCC), with Witschey serving as its president and chief executive from 1970 until 1984. At its peak, TCC had 1,200 employees nationwide and $32 million in annual revenue. It was a smaller rival to Ross Perot's Electronic Data Systems, providing Medicaid fiscal services for Virginia and several other states with its bank of refrigerator-sized mainframe computers. "We operated computer systems here in Richmond which you could dial up very much like dial-up Internet connections are today, the slow ones," Witschey says. "You could dial up our computer and use it to do computations or business work, and it was called a time-sharing service because a very large computer handled the demands of multiple people at once. Of course today, Internet servers do the very same thing. So this was a pre-Internet kind of remote teleprocessing service." Witschey was ahead of his time in other ways, too. In 1975 he opened  and closed  Richmond's ill-fated first retail personal computer store, Computers-to-Go, unsuccessfully attempting to sell Richmonders the 8-bit Altair 8800, a precursor to the more popular home PCs that would come in the late 1970s and early 1980s. "It was early," Witschey says, with rueful laughter. "Too early." Witschey oversaw the sale of his company to Blue Cross Blue Shield in 1983 and stayed on as CEO for a year afterward. Then at age 43, Witschey went into semi-retirement, volunteering on the Science Museum's board, and doing pro-bono computer consulting work for Richmond-area nonprofits. That's when Witschey's life came back around to Maya archaeology. His wife, Joan, suggested it would be a perfect time for him to look into it. So he made a goal of seeking out meetings with two archaeologists a month to learn about current discoveries and make contacts. George Stuart, a noted Maya archaeologist with the National Geographic Society, told Witschey to check out the archaeology program at Tulane University. He did, and Tulane was so impressed with Witschey he was offered a full scholarship to enroll. The Witscheys moved to New Orleans, where Joan Witschey sang for the New Orleans Opera. At Tulane, Walter Witschey was 20 years older than most of the other students. He was even a couple of years older than his faculty adviser. "Every time I tell somebody I am an archaeologist, they say, 'I always wanted to do that!' but Walter is one of the very few people who actually did that," says his research partner Brown, who was a doctoral student alongside Witschey. "He went back to school and became an archaeologist." Witschey's doctoral project was the first major archaeological assay of Muyil, an ancient Maya site about 10 miles south of the popular ruins at Tulum, which are well-known to tourists of Cancun. "The site was occupied before 400 B.C. and was occupied continuously until the arrival of the Spaniards in 1511," says Witschey, who received his doctorate in anthropology with a specialty in Maya archaeology from Tulane in 1993. A little more than 10 years ago, Witschey and Brown began working on their Electronic Atlas of Ancient Maya Sites, which precisely maps more than 4,600 archaeological sites using geographic information system (GIS) technology, which logs into a computer database the exact coordinates for locations in relation to latitudes and longitudes. These locations are often obtained by using Global Positioning System (GPS) receivers, which can tell the receiver's precise location by getting map coordinates from a satellite orbiting Earth. Witschey and Brown began their atlas project working under the hypothesis that by mathematically examining the distribution of known Maya archaeological sites, they could deduct where other unreported sites might still be found. "Some of our colleagues had suggested there weren't any sites [in these areas] for a variety of reasons," Brown says  "the soil, the water wasn't good. And maybe there weren't any sites, but we thought that wasn't true, and of course there were sites there. "I think a lot of people are under the impression that a lot of this stuff is all known," he continues, "but there are large areas that have not been investigated." Says Witschey, "We didn't expect to find another monster site" like Chichén Itza or Uxmal, large Maya ruins that are well-known to tourists. Instead, "we were looking for the small villages and hamlets in between the big cities. We were interested in really filling in the picture between several enormous [Maya] sites." If Chichén Itza was to the Maya what New York City is to us, Witschey says, then he and Brown were searching for the equivalent of Oilville or Frog Level. Witschey and Brown conducted their six-week expedition into the Yucatan jungle in summer 2005. They'd begin their days around 5 a.m., taking along a small party including graduate students and native Maya guides  who speak Mayan, an incredibly difficult language of which Witschey and Brown speak just a little. They'd take vehicles along dirt roads into the jungle for miles, as far as they could go. "We worked hard to find out how close we could get [to the search sites] with a vehicle," Witschey says, laughing. But, at some point, the beaten paths would disappear into the jungle and that meant hiking three to four miles on foot in small groups of three or four people through dense vegetation, with the machete-wielding Maya chopeadores (literally "people who chop") hacking a path through the jungle ahead. trees that dripped toxic sap that's like poison ivy and much worse, caustic saps that burn your skin off." During their expedition, Brown himself walked into a bush and had a thorn driven into his forehead, knocking him unconscious. It had to be pulled out with needle-nose pliers. Witschey and Brown knew what hazards to expect and planned accordingly, so despite all the dangers, the worst accidents suffered were the thorn in Brown's head and mild cases of heatstroke and dehydration suffered by the gringos of the expedition. You have to wear long pants and shirt in the sweltering jungle because of the malaria-carrying mosquitoes, so sunstroke is a serious threat. "When we moved around, we carried two gallons of water on our person, and, the end of the day, it was gone. And," Witschey says with modesty, "you don't need to add the next piece, which is you never made a rest stop." "We took some long walks," Brown says. "It was very good exercise. If you need to lose weight, go to the Yucatan. I think we lost a total of a hundred pounds together. We went to some places that were quite remote." "It's a jungle in which it's easy for you and me to get lost," Witschey says. "The phrase down there is it's a 15-meter jungle, and that's not how high it is, but how far you can see into it. In other words, beyond 45 or 50 feet, you can't see anything except the greenery, and it looks the same in all directions. The sun is overhead, so there's no orientation from shadows, and you can get badly lost." So GPS units were a must and prevented the group from losing its way. If they came across an ancient Maya site, they'd clear just enough vegetation to make accurate measurements by GPS for later entering a site's location and dimensions into the GIS atlas database. They'd also look for artifacts, such as pottery shards that could date the site. And come across sites they did. a ceremonial temple pyramid or truncated pyramid just adds to the thrill." Out of 35 sites located by the Witschey and Brown expedition, 25 were unknown to Maya archaeologists, though the native Maya might have come across them while clearing the jungle for corn farming. Those 25 sites include what Witschey describes as a "handful" of temples and pyramids, some 60 feet high. "We did better than expected," Witschey says. Brown recalls the moment he and Witschey were "way the hell out in the jungle, with not even a path" to follow. Their team found a huge pyramid buried behind vegetation, its peak reaching just above the jungle canopy. "This is what we hoped for, but we didn't know it was there until we found it," Brown says. With excitement, "we climbed this pyramid. It was very, very steep." When they got to the top, they could see about 40 miles out. With cell-phone towers visible far distant on the horizon, he says: "Walter flips open his cell phone and calls his wife! It was great! We were above the jungle. There was great reception  no interference at all." Though puny compared with the massive 100-foot-plus pyramids at Uxmal and Chichén Itza, finding an unreported 60-foot pyramid is definitely significant, says Andrews, director of the Middle American Research Institute at Tulane University. "Anytime you go into a new area and find a whole bunch of new sites  big, medium and small  you add to the depth of our knowledge about the ancient Maya." More important, Andrews says, is the Electronic Atlas that Witschey and Brown are developing, which Tulane plans to eventually publish on DVD or some other format. Their fruitful search has proven the atlas' value and "it has almost unlimited possibilities," Andrews says. "It's really very exciting." Witschey is leading a guided, nonresearch tour to the Yucatan for the Science Museum of Virginia this month, but he and Brown have plans to return to the jungle to perform more fieldwork in the coming years. They're hoping to learn more about the interaction between the big Maya cities such as Chichén Itza and the smaller locations like the places he and Brown found overgrown in the jungles. They want to "tease out more of the details of the shifting political and military alliances between the many city-states," Witschey says. They'd also like to know more about the smaller local temples they found. "It's hard to know exactly what the little [pyramids] were used for," Witschey says. "By way of analogy with the large ones, you would assume that the local ruler or the local high priests were conducting religious or astronomical ceremonies and rituals on these." While their "field-truthing" trips to the jungle can be fraught with dangers, both Witschey and Brown can't wait for more.